Distributor: Tiny Love Inc., of New York, N.Y. and the Maya Group Inc., of Huntington Beach, Calif. 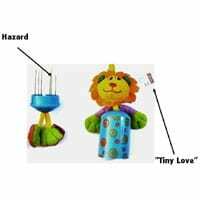 Hazard: The wind chime toy can be pulled apart exposing sharp metal rods, posing puncture and laceration hazards to the baby. Incidents/Injuries: The firm has received five reports of babies pulling apart the wind chimes exposing the sharp metal rods, including a report of a minor injury to a 24-month-old baby who punctured his cheek with the rods. Description: This recall involves wind chime toys sold separately, with the Gymini Kick & Play Activity Gym and Tiny Smarts Gift Sets. The toy produces the sound of a wind chime. “Tiny Love” is printed on a tag on the toy. *The Wind Chime – Duck is sold with the Gymini Kick and Play Activity Gym. Only the Duck Wind Chime is affected by this recall. *Bunny Wind Chime is the only product affected by this recall. Wind chimes sold with other Tiny Love Activity Gyms are not included in this recall. Sold at: Toys R Us, Walmart, Target, Buy Buy Baby and TJ Maxx stores nationwide from February 2002 through February 2010 for about $8 separately, $22 for the Tiny Smarts Gift Sets and $70 with the Gymini Kick & Play Activity Gym. Remedy: Consumers should immediately take the recalled wind chimes from babies and contact Tiny Love to receive a free replacement toy. Consumer Contact: For additional information, contact Tiny Love toll-free at (888) 791-8166 between 8 a.m. and 5 p.m. ET Monday through Friday, or visit the firm’s Web site at www.tinylove.com.